The ruling hits on a pivotal issue in the potentially groundbreaking case in which 25 living patients and the families of three who have died claim the Infectious Diseases Society of America and six physician-researchers conspired with eight insurance companies to limit Lyme disease treatment. The defense subsequently submitted 29 sealed documents in the names of 24 patients. In another filing, the defendants made clear that they will use patient tests and diagnoses to assert the patients do not have Lyme disease. Lyme disease tests have long been known to be inaccurate, with evidence growing of the pathogen’s ability to subvert immune responses on which the test is based – an issue that is likely to be argued in the lawsuit. The hearing in Torrey v. Infectious Diseases Society of America et al also focused on several other contentious issues that will define the scope of the proceedings — and its chance of prevailing. At this point, the lawsuit is still scheduled for a trial in late June. Patients must provide a tally of the personal costs incurred as a result of the IDSA-insurer policies. This would include lost wages, travel costs to other far-flung providers and the uncovered costs of their care. Significantly, they aren’t seeking damages – just reimbursement. 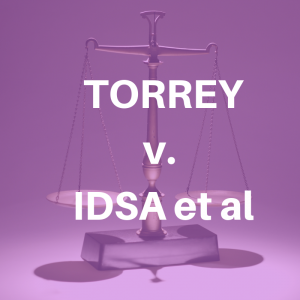 Patients’ attorneys were granted more time to argue that the IDSA defendants likely violated the Racketeer Influenced and Corrupt Organizations Act; the patients hope to prove the defendants acted as a criminal enterprise that used IDSA treatment guidelines as a “predatory device,” driving out competing doctors and harming patients. The judge has already ruled the suit can go forward on assertions that the defendants violated anti-trust laws. The parties are still hashing out issues related to documents to be provided under discovery. The defendants previously were to provide documents dated from four years before the suit’s filing – or to November 2013 — to which the patients’ side objected. The court told the parties to settle on a “reasonable amount of time for defendant to go back for documents.” The plaintiffs, meantime, have been told to “produce all documents going back to beginning.” It is unclear what “beginning” means. In another development, the two sides agreed on the scope of emails to be turned over in which patients discussed their Lyme conditions. It was not immediately known what search terms were accepted. After the hearing, the court posted slides on pending defense arguments: That claims against the six named physicians should be dismissed based on a lack of jurisdiction; that 11 plaintiffs should be deposed (which the Torrey attorneys disputed pending resolution of the discovery issue); and that the Torrey side has failed to comply with a court deadline to prove the case qualifies as a claim under the racketeering law, or RICO. Click here to read documents filed in the case, including the lawsuit, assorted motions, the slides referred to above and a summary of the hearing. Mary Beth Pfeiffer, an investigative journalist, is author of “Lyme: The First Epidemic of Climate Change.” View, comment on and share her TEDx talk on the scourge of ticks.